It’s time to get fresh and meaty. I created this recipe for an upcoming class I am teaching at Cavallo Point in Sausalito, California on Scandinavian cooking. While traditional Scandinavian cooking may be heavy and meat focused (especially in the winter) it delightfully tips to an abundance of fresh produce in the warmer, brighter summer months. This recipe marries the Nordic climate extremes with a spin on the Swedish meatball, which is traditionally pan-fried and then napped with a warm cream sauce. These ground meat patties are transformed into fun finger food, freshened and brightened with tufts of parsley and dill. The heavy sauce is replaced by crisp lettuce leaves for wrapping and a sweet-piquant cranberry compote and a dab of yogurt. In Sweden, lingonberries, also known as cowberries, are prolific in the late summer. Cranberries may be substituted for the lingonberries. If you can’t find any rye bread crumbs, then panko will do. Makes about 28 meatballs. Combine all of the ingredients in a medium saucepan over medium heat. Cook, stirring to dissolve the sugar. Reduce heat to medium-low and simmer until berries break down and compote thickens, about 15 minutes. Remove from heat and cool. Remove and discard rosemary sprig. Melt 1 tablespoon butter in a small saucepan. Add onion and garlic. Saute until softened but not browned, 3 minutes. Transfer to a large bowl. Add remaining ingredients except for the remaining butter. Using your hands, gently mix the ingredients to uniformly combine without over mixing. With a light hand form meat in 1 ½ inch meatballs. Place on a platter. Melt 2 tablespoons butter in a skillet. Add meatballs in batches without overcrowding. Saute until browned on both sides and thoroughly cooked through, about 8 minutes. Transfer to a plate lined with paper towels to drain. Repeat with remaining meatballs. If necessary, add more butter. Keep warm. To serve, place 1 to 2 meatballs in center of lettuce leaf. Spoon a little compote and yogurt over. Garnish with parsley and dill sprigs. Roll up and eat. Yum, I wish that I had some for lunch. Love the combination of flavors. Thanks,Linda. What a wonderful combination of flavors! I love the cranberry sauce addition. I’ll look for lingonberries – I see them every once in awhile. Good luck with your upcoming class! Very exciting! I’m a Finn and I love love swedish meatballs. Usually we eat them with the mashed potatoes but this is a welcome twist to it! Making these to my next dinner party!!!! These wraps look delicious! I enjoy cooking and eating Swedish meatballs every winter, but I never thought of adapting with fresh tastes for the summertime. Thanks for the inspiration! Lovely presentation and the addition of dill sounds fabulous too, my favourite herb with meatballs. How healthy & unique flavors. I love meatballs of any kind. Cant wait to try this compote as soon as autumn knocks here. The lettuce pockets sound yum! 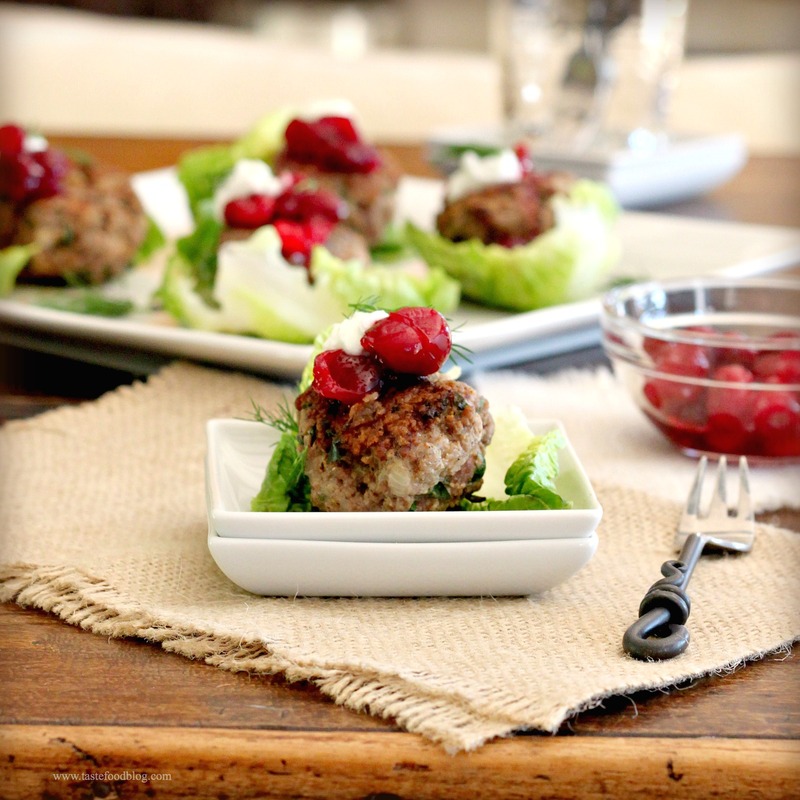 I love the idea of the cranberry compote with a meatball. Looks great! These look great and I like the idea of serving the meatballs in lettuce cups- healthy and easy to pick up! Wish I lived in California- your class looks terrific! I have never dabbled in Scandinavian cooking before, thanks for giving me a delicious reason to start. A marvelous idea and combination! So tasty and wonderfully Scandinavian. I love sweet and savory food.